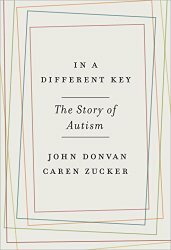 In A Different Key, by John Donvan and Caren Zucker, is described by its publisher as “the definitive history of autism.” Its story begins in the 1930s, with a portrait of "autism's first child" Donald Triplett, then moves to "father of child psychiatry" Leo Kanner, who was the one to diagnose Triplett with autism. In the following decades, readers encounter a variety of researchers and parents as they grapple with questions about the origin and nature of autism. This history is a complex and nuanced one, yet Donvan and Zucker tell a fairly straightforward David and Goliath narrative. The role of the villain, Goliath, is played not by a person, but by autism itself. Anyone fighting autism becomes the book's sympathetic, underdog David. Which means that, unfortunately, In A Different Key becomes a chronological collection of anecdotes about these "heroic" battles. Donvan and Zucker also fail to provide balanced, comprehensive information about autism. They present autistic traits as cryptic and strange, with autistic people themselves characterized as walled off in emotionless prisons. The authors describe well-known facets of autism such as lack of eye contact, a need for sameness, and so on -- but not much more. The book's simplistic treatment of autistic traits and people is a serious concern, such as when a child's autistic traits are (mistakenly) offered as proof of an inability to feel love or emotion. Certainly, some autistic traits can be extremely painful or difficult to manage, and autism can be a disability. And, at the same time, many traits, like echolalia and stimming, can be a natural, healthy part of autistic life. They can be paths to joy and fulfillment, not obstacles. Yet the range and complexity of such spectrum traits remain unexplored by the authors. In fact, if you were to only learn about autism by reading In a Different Key, you would imagine it to be a grim, living death sentence. One consequence of Donvan and Zucker’s stigmatizing approach to autism is that, by definition, any effort to eliminate autistic traits is seen as noble and beneficial. This is where the book loses its ethical footing: by shoehorning autism into the role of villain, the authors are rejecting the sort of cautious, sensitive distinctions a subject like autism requires. This ethical imbalance becomes apparent once we meet the book's primary hero and savior: UCLA psychology professor Dr. O. Ivar Lovaas. In the late 1950s, Lovaas developed techniques for attempting to normalize children with perceived atypical behaviors. His Applied Behavioral Analysis, or ABA therapy, involved shaping the behaviors of autistic children through the systematic application of “aversives” -- including physical violence, and cattle prods. Non-verbal children were shocked or slapped in order to elicit speech. Or, if an autistic child found eye contact uncomfortable, they would be traumatized, using these methods, until they held a gaze. Zucker and Donvan do not frame this origin story of ABA therapy -- still the most commonly used contemporary therapeutic approach for autistic children -- as a dark chapter in autism history. They don't even use neutral phrasing. Rather, Lovaas's abuses of autistic children are presented as necessary measures in the fight against autism; and his “victories,” such as forcing a child to suppress all their autistic traits, are also the authors' victories. In A Different Key's coverage of Lovaas is not only a celebration of the effects of aversives. It also assures readers that many children seen by Lovaas were given rewards like ice cream -- once they learned to follow commands. One girl is described as “recovering” from autism, all because a Lovaas follower gave her cookies. Seeing abuse and cookies as equally effective forces in a productive cost/benefit analysis: that mindset is only possible if autistic people are objectified -- not seen as human beings, but instead as as problems to be solved. That's how a sadistic child abuser with a cattle prod becomes the hero of In A Different Key. The authors do include some genuinely moving stories. The efforts of parents in the 1960s, both in organizing and pushing for their children's education rights, and in fighting against damaging parenting myths (e.g., the “refrigerator mother” theory), are presented as necessary and valuable additions to a history of autism. In the chapter From Courtroom to Classroom, a father sues his local school district in an effort to win more therapeutic supports for his son. During a court hearing, he yells at county officials, and berates anyone who challenges his requests. The authors acknowledge that, for strategic purposes, the father unfairly demonizes one of his opponents. But, he also wins his case. The authors frame his yelling and attacks in a positive light, as tactics that are just part of the job when you are a parent activist. In a later section, readers are introduced to autistic self-advocate and disability rights activist Ari Ne'eman. He is presented as tenacious: his style is blunt, and when people criticize his views, he doesn't waver. But the authors suggest that Ne'eman's tenacity and stubbornness -- the same traits that won the father's court case for his son -- are actually proof of autistic cognitive impairment. Ne'eman is portrayed not as a devoted activist, but rather as an emotionless autistic robot who lacks the ability to connect with people, or feel empathy. Donvan and Zucker even describe Ne'eman as lacking empathy twice in the same chapter, to make sure readers get their message. It's ugly stuff. And it underscores the inevitable problems that arise when a complex topic like autism is reduced to a simplistic, black-and-white, good-versus-bad narrative. It's also frustrating. In A Different Key did not need to include these toxic, unnecessary divisions between parents and autistic people. Other recent books that cover similar territory -- Uniquely Human, NeuroTribes, and The Real Experts -- share stories from many different autism and autistic perspectives, without constantly shutting out or belittling a particular group. Those similarly-themed books also illustrate why Donvan and Zucker should have chosen a more humanizing and realistic narrative. The authors could have educated readers about the challenges autism can bring, and also the vibrant, meaningful connections autism can forge. They could have told the powerful story of parent activists, and also the powerful story of autistic activists. Instead, the authors have written an outdated autism-as-villain story, and their "definitive history" is deeply flawed. Ultimately, In A Different Key is a self-described “story of autism” -- that cynically leaves out truly helpful material about autism and autistic people.